Be prepared to go at a Japanese Wedding this week-end. The bride and groom are going to wear Japanese clothes so they need your help, especially the bride because she can`t decide what to wear. 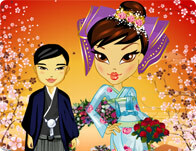 Help her and I am sure you'll fall in love with these traditional and contemporary Japanese wedding fashions.